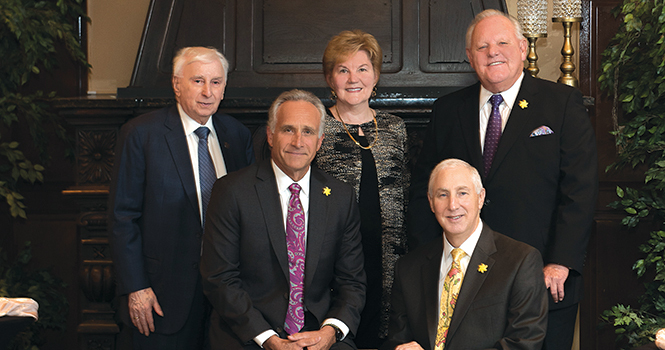 For the ownership team at Berkshire Hathaway HomeServices New Jersey Properties, it’s all about focused growth—and maintaining a company culture that thrives on performance and professionalism. The company, which reported volume last year of over $1.5 billion, has grown its agent population by nearly one-fourth in the last three years alone, from 650 to more than 800. “Our approach to building the company is to focus on people who can make a full-time commitment to the industry, their customers, and our company,” says Chairman and CEO Bill Keleher. “We excel at helping this type of individual reach the next level of growth both personally and professionally.” In this exclusive interview, Keleher and company President Chris Brown discuss the team’s singular strategy: a collaborative, people-centric culture that inspires ongoing quality, performance and innovation for the next generation of real estate. Barbara Pronin: Let’s begin with a recap of your individual career paths, and how you got on this present road together. Bill Keleher: I grew up in Kansas City, Mo., went to college in Virginia and then came to New Jersey for a month to visit my two best friends in Westfield. When I decided to stay longer, I got a temporary job in a clothing store where I met a couple of young men who were in the real estate business with a local firm. After getting to know them, I made a decision to try real estate, as well, and 48 years later, I’m still in New Jersey and still in the real estate business. I began in sales in a small office in Westfield, went on to become a manager, sales trainer, regional manager and finally president of the 12-office company that I ultimately purchased. I sold that company in 1986 to Schlott REALTORS® and worked for them until I had the opportunity to purchase Prudential New Jersey Realty from Prudential Real Estate in 1991. In the ’90s, I acquired numerous other small Prudential companies in New Jersey, and in January 2001, I merged the company with Prudential Pioneer (Seymour and Nancy Litwin’s company) and Prudential Brown-Fowler (Chris Brown’s company), forming Prudential New Jersey Properties. Steve Janett joined our ownership team in November 2006 when we acquired his company, Prudential Janett Real Estate. Chris Brown: I, on the other hand, grew up in real estate, but swore I’d never get into this hectic business because I saw my dad always running out to his next appointment. So, in 1980, I graduated with a business and forestry degree from the University of Vermont and went to work for the Aspen Ski Corporation in Colorado. Returning to New Jersey that summer, but on my way to Norway to pursue a relationship with Brit, a girl I had met there during my junior year of college, my father convinced me to get my real estate license. I actually did, and soon after, sold my first house for $350,000, making more in that one transaction than I had made the entire year living in Aspen. Not a bad start in 1983, and it convinced me to stay East and launch my real estate career at my dad’s company, where I sold houses for many years and took on ever-increasing responsibilities. Brit and I married in 1984, and I was appointed manager of our Summit office four years later. I held that position until the untimely death of my father in 1994, when I purchased the company from his estate. In the mid-’90s, Bill, Seymour, Nancy, Steve and I came together to form a successful mortgage joint venture, which gave us the working relationship needed to later form our current company and ownership team. BP: When and why did you become Berkshire Hathaway HomeServices, and how does the brand help support your success? BK: At the end of 2011, Brookfield Residential Property Services, now BGRS, acquired the Prudential Real Estate Franchise Network and subsequently sold a controlling interest in the network to HomeServices of America. In 2014, we had the opportunity to join the new brand that HomeServices had created, Berkshire Hathaway HomeServices. It was a natural fit for us to align with the prestigious Warren Buffett brand. It’s unique in the real estate space, one of the most widely recognized and respected brands on earth, and it gave us, among other things, a tremendous opportunity to grow our company through recruitment and acquisitions, and also expand our footprint in the luxury home market. CB: There’s a distinct energy inherent in the Berkshire Hathaway brand, and it delivers on every level in terms of innovation and support. BP: How would you describe your positioning in the marketplace today? What is it that sets you apart from the competition? BK: We are one of the leading real estate companies in the New Jersey marketplace, the largest independently owned and operated Berkshire Hathaway HomeServices affiliate in the state, and a member of the prestigious Berkshire Hathaway HomeServices Elite Circle—and its predecessor, the Prudential Real Estate Gibraltar Circle—since their inception. Our overall closed volume last year was over $1.5 billion. The key to that kind of success, I think, is really what sets us apart: our total commitment to the professionalism of our agents, and their total commitment to excellence. CB: Communication is a good part of that. We see ourselves as being large enough to provide our people with everything they need to succeed, but small enough so that every voice counts. Our ownership team is never up there in an ivory tower. We’re all accessible, involved in the day-to-day, and we build relationships with each and every agent. We have a caring culture, competitive in the very best sense, and that’s a valued and motivating asset. BP: How, specifically, have you been able to grow the company as you have? CB: It starts with the people we hire. Whether new or experienced, we are only interested in full-time, professional commitment—and because of our reputation as a company of achievers, many new and experienced agents seek us out. We are willing, able and happy to provide personalized training, coaching, and support, but only to those with an unwavering commitment to be the best. BP: What is it that attracts agents to you, and why do they stay? BK: They are attracted, primarily, by our standing in the industry as a whole and our strong presence in the many communities we serve. They know we want and expect the best from our agents, and that we operate in ways that inspire success—and they want to be a part of that. For our part, we try to make very sure that the people we bring on are truly a good fit with our culture. CB: And they stay with us, basically, because we deliver on our promises. People enjoy and thrive when working with successful colleagues and mentors, where success is celebrated, great training is ongoing, and support is available whenever needed. BK: We’ve been able to augment our own effective training systems with proven Berkshire Hathaway HomeServices strategies—and as president of the company, Chris has stepped up in the area of coaching and training. He hired a vice president of Learning and Development who is building a great curriculum. It’s very personalized and goal-oriented—for example, working with an agent who’s ready to navigate the leap from $5 million in production to $10 million. CB: And at the branch level, every one of our managers is focused on coaching and training. They are very hands-on, with specific curricula designed for agents at every level of experience. Success is a partnership, and we respect that and encourage it. With our agents, as with our customers, we understand the value of face-to-face. We’re very much into building relationships, making “warm calls,” and maximizing the value of one’s personal sphere of influence. BP: What’s your strategy for marketing the firm to serve the needs of prospects and clients? BK: We have an excellent chief marketing officer who understands our core belief in building customer relationships and doing so in a variety of ways, from social media engagement across many platforms to proprietary market reports to a full luxury marketing system, and more. CB: Part of our visibility in the community comes from our longstanding commitment to the Sunshine Kids, a national organization devoted to helping children with cancer. We “adopted” the Sunshine Kids years ago as a Prudential franchise and we support them to this day, having raised over $1.5 million from our offices’ local efforts, our annual corporate golf outing and generous donations from the community. Steve Janett, our COO, spearheads our committee and is committed to reaching our annual Sunshine Kids goal by working with and supporting our office liaisons, as well as chairing our annual golf event. BK: We provide our agents with the cutting-edge tools they need to compete in an aggressive marketplace. We are engaged heavily in digital marketing, and we empower our agents to use our tools as touchpoints to remain top-of-mind with their spheres of influence. We have e-marketing campaigns and automated systems, and tech gurus who keep us on track—but we’re also aware of just how vividly a personal phone call stands out. CB: It is always a mix of technology and personal touch. Our top four agents last year closed some 200 transactions and did $80 to $100 million in volume—and much of that was accomplished by reaching out and staying in touch in the most traditional ways. Others have embraced our online technologies including our CRM, our back-office business center and our brand’s resource center. We also encourage agents to work with industry thought leaders, such as Brian Buffini and Tom Ferry, who both deliver different messaging and strategies for agent growth. BP: What’s on track for the future of the firm? BK: Our goal is to be sure that every buyer and seller with whom we work has the best possible customer experience, because we know that is the basis for growth. So, we continue to look for the best agents to represent our banner—and we are always open to new opportunities, including strategic acquisitions, that will help expand our statewide footprint. CB: Changes to our industry and growing demands from today’s sophisticated consumer seem to be coming at a faster and faster pace. It’s a critical balance to achieve—embracing new technologies while honoring what made us successful in the first place: integrity, trust, experience, and an overarching commitment to excellence. Millennials are the future, and there is a sharp focus on understanding what makes them tick—I know, I have two. While having great technology plays an important part in attracting them to our company, treating them with respect and earning their trust is crucial to keeping them engaged. It’s still a people business, after all. That’s why our brand is more important than ever. In this day of new and emerging business models, the Berkshire Hathaway HomeServices brand is a promise of the highest standard, and it compels us to constantly reinvent ourselves in order to remain relevant and valuable to today’s real estate professional and our buyers and sellers. For more information, please visit www.bhhsnj.com.